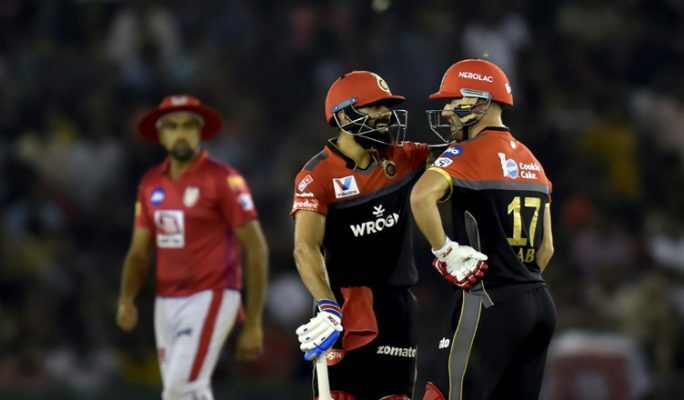 Mohali: Sensational fifties from Virat Kohli and AB de Villiers overshadowed Chris Gayle’s unbeaten 99 as Royal Challengers finally snapped a six-match losing streak this IPL season with a eight-wicket win over Kings XI Punjab here Saturday. RCB could have dismissed Gayle in the first over itself when he was hit on the leg by Umesh Yadav but Virat Kohli didn’t go for a DRS and the West Indian escaped. Gayle made RCB pay for the mistake as he hit a four and six off Umesh’s next over, before Rahul joined the party and smashed a couple of fours off the India pacer in his third over. Chahal was then introduced into the attack and Rahul lifted him over long-on for a maximum but the spinner had him stumped in the next delivery to produce a crucial breakthrough. Mayank Agarwal then joined Gayle, who completed his fifty in 28 balls. Agarwal smashed Chahal over extra cover for a six but the spinner cleaned him up in the next delivery as Punjab slumped to 86 for two. Sarfaraz Khan (15) and Gayle then took Punjab across the 100-mark before the former was caught behind off Siraj’s delivery. Sam Curran (1) too couldn’t stay long and was removed by Moeen Ali as Punjab slipped to 114 for four in 14th over.